Acer’s first go at crafting the thinnest convertible in the world is held back by the world’s most antiquated trackpad and charger, but it makes up for it with a satisfying keyboard, the ideal amount of USB-C ports and a subtle design that works in its favor. If nothing else, the first of Acer’s “Spin” convertible lineup was a feat to pull off. 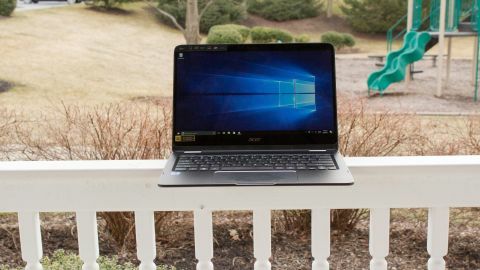 Though it just so happens to be the world’s scrawniest hybrid notebook, it still fails to beat Acer’s own Acer Swift 7 of this year in terms of thinness alone. Despite being sleek and versatile, boasting four different modes to put its 14-inch screen on display, the Spin 7 succeeds in more than just appearances. The rebranded Intel Y-series processors show up in the form of the 7th-generation Kaby Lake Intel i7-7Y75 processor, complete with the fanless designs of the former Core M-series chips. While you shan’t expect it to fly nearly as fast as the full-on i7-7500U featured in the likes of the Dell XPS 13, you should have your battery to thank you for it. Unfortunately, we find the Spin 7’s longevity to be middling, but it offers a gorgeous 2-in-1 experience all the same. The cost of the Acer Spin 7 – $1,249, £1,099 or AU$1,999 – lands about where it should for a notebook of its stature. Seeing as there’s only one configuration to choose from, bearing a 7th-gen Core i7 processor and stunning appearance, it seems appropriately priced. That is, of course, until you dive into some details in the nitty gritty. Keep in mind, the Acer Spin 7 is available across the US, UK and Australia at the aforementioned respective price tags and comes exclusively furnished in a black all-metal finish. It can be purchased directly from Acer’s website, on Amazon or practically anywhere else laptops are sold. In addition to the obvious convertible design aspects, the Acer Spin 7 is graced with an all-metal chassis, a lean, albeit comfy keyboard and even a wide-angle glass trackpad embellished with decorative chamfered edges. Acer even went as far as to match the border of the trackpad with its pair of silvery hinges. The keyboard exhibits travel that’s far superior to the MacBook’s infamous butterfly switches. Instead, it feels like a normal chiclet keyboard you would use for a work desktop in 2017. Even so, it’s not without its faults. The absence of LED backlighting could be read as an oversight for a laptop in this price range. Unfortunately, regardless of whether you decide to use the Acer Spin 7 as a traditional laptop, a tablet or a multimedia tent, you’ll be disappointed to discover that the speakers are placed on the device’s underside. This makes for a rather inconvenient way to listen to music or watch videos considering they’ll pretty much always be in contact with another surface. Though we’re blessed to have a keyboard that is this damn pleasing on the fingers, the same cannot be said of the Acer Spin 7’s trackpad. As much as we wanted to love it for its sheer latitude, we suppose it couldn’t be helped that, when moving from this to a MacBook, performing clicks made the 2-in-1’s touchpad feel like a chore in comparison. It’s nice to have a wide-angle touchpad, but it’s definitely a burden to fully press down on every time you need to click on or highlight something, and it doesn’t help that it’s distractingly loud when you do so. At least, at the same time, there’s a touchscreen in place to emulate the trackpad functionality more quietly.